Prior to D.A. Carson’s biography of his father, few of us had ever heard of Tom Carson. He did not pastor a large congregation, he did not preside over a college or seminary, he did not leave a legacy of voluminous writings, he was not a sought after conference speaker; in a word—in his son’s words—he was an ordinary pastor. He was what many of us already are or will be in the near future. That is not to look down on those who have been gifted to shepherd and reach a large number of men and women for Christ; being unknown is no more a virtue than being well-known, and we can thank God for the gift of godly teachers he has given the Church. But the main encouragement Carson provides in this little book from the life of an “ordinary pastor” is found in the faithfulness with which his father carried out his charge, despite what appeared to be, to Tom at least, seasons of little fruit. During his years in ministry, Tom kept a journal. Though it was more regular at certain times than at others, we are able to see into the more intimate details of the life of this ordinary pastor. D.A. Carson confesses that his father was, for the most part, a private man who kept to himself. Yet, thoughout his journals we find a man whose heart was set on faithfully carrying out the task that God had laid before him. His journal began during the last four years of a fifteen year stay in Drummondville, Quebec, when, apparently, Tom was struggling with what his son calls, “Dark nights of the soul” (61). Tom’s spiritual intensity carries throughout many of his entries, but so does (what is often a parallel in such a case), self-recrimination for wasting precious time and opportunity. Yet, within this chapter that focuses in on Tom’s struggles with a looming sense of failure and unfrutifulness, D.A. Carson provides nine points of counsel that make this book worth far more than what you will pay for it. In these nine points, Carson examines his father’s tendency toward negative appraisals of his ministry and gives much needed admonishment and encouragement to those who also tend to view life through this kind of perfectionistic grid. Although I will not list all nine here, I do want to mention a few things that I found helpful. I found the book to be the encouragment it was said to be. It was refreshing. I found it very refreshing as well. 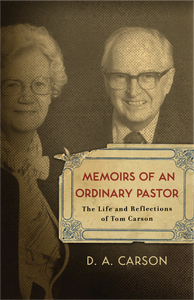 Tom Carson’s life reminds me that God’s measure of success in ministry is the degree to which we have been faithful. And for what it’s worth, I love Yosemite, too.